Last year, the Office Fund made its first investments since 2008, investing some € 138 million in prime properties in Amsterdam and Rotterdam. This made it something of a historic year for the Fund and potentially signals a new sense of focus in the office market. This is not to say that the office market is not still an extremely challenging segment. But thankfully, while everybody accepts that the office market as a whole is still problematic, they are also realising that there are excellent opportunities in this market. This is certainly true for multi-tenant office complexes in multi-functional environments with high sustainability scores and easy access by public transport and car, and even more so in the four main Dutch cities: Amsterdam, Rotterdam, The Hague and Utrecht. Of course, as we have been pointing out for some time, this has created a clear distinction between the primary and secondary office markets, which means you have to be extra careful about where you invest. We have been reluctant to invest because we believed some office buildings were simply overpriced, while values for other prime properties were still falling. However, we now believe values are bottoming out in several prime markets, most notably in Amsterdam and Rotterdam, which is where we made our acquisitions. We acquired two prime properties in Amsterdam, the Valina building in the centre of Amsterdam and the former Citroën buildings in the popular southern part of the city. And at the very end of the year we acquired the Beurs-WTC, in the heart of Rotterdam’s business district. These are all very promising acquisitions; the locations are perfect and two of the buildings are multi-tenant complexes, in multi-functional environments and all are in major cities, with excellent transport links. 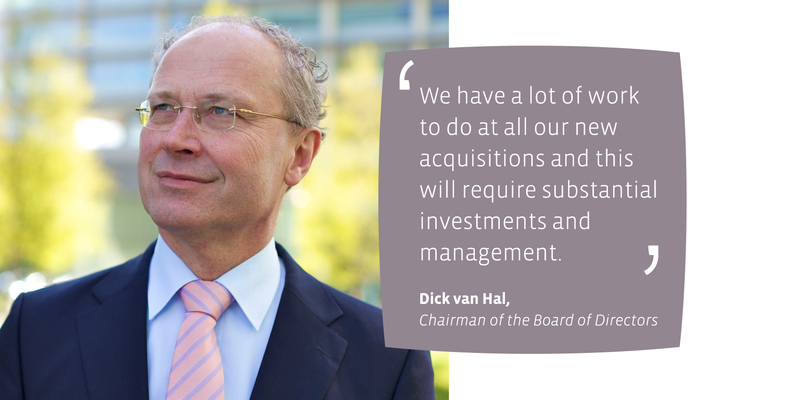 So we are very optimistic about the future of these acquisitions. Investor interest is certainly picking up in the office market and I think the fact that we were approached by several investors last year shows that our strategy is working. Our focus on quality and prime locations with a multi-tenant, multi-functional element means that we have a very high-quality portfolio. And our lack of leverage and our dividend policy make the Office Fund an attractive investment. Obviously, we have a lot of work to do at all our new acquisitions and this will require substantial investments and management. But we are a long-term investor and it is very likely that we will be working with the local authorities in Amsterdam and Rotterdam to help develop the local areas, making both offices (and shops) and the surrounding area more sustainable, creating a win-win situation for us and the cities. I would like to thank all our employees for their commitment, dedication and hard work in what was a very busy, challenging and ultimately exciting period for the Fund. I would especially like to thank the acquisition team. The Beurs-WTC deal was a complicated transaction and took a lot of time and effort. And I was very impressed with the teamwork between the Retail and Office teams in the final stages. They all did an excellent job.